This afternoon I sat on the couch frantically folding laundry before going to work. My mind was racing, but my body was on freeze frame. Why was I moving so slow? Why do I feel so exhausted when I've been lamenting for the last half hour about how I didn't get anything done today? I was in that typical mother mode of getting down on myself because I didn't get through my list. Oh the list! Every single day it's there, taunting me from the bulletin board of my over stuffed mind. When Nelson and I were registering for wedding gifts, the lady who set up our registry gave me an analogy that I haven't forgotten in nineteen years. "I find," she said casually, "that men are filing cabinets and women are bulletin boards." "Yeah, okay, whatever," is what I'm pretty sure I was thinking with all the sage wisdom a single person about to be married has, "give me the scanning gun and let me go." "You see," she continued, "men see things that need to be done and they file it. They put it away until they can get to it and they don't think about it in the meantime. Women, on the other hand, put everything up on a bulletin board where they see everything all of the time. They don't stop thinking about it until it's done." Even though I was young and stupid, I recognized her wisdom the minute it left her mouth. That's where I sat this afternoon. I was folding laundry, looking at a bulletin board with a multitude of little papers pinned on it...three notes thick in many places. I ran out the door to go to work, still ruminating about those never ending lists - kicking myself over and over again because I didn't take one single thing off of it today. Then, I paused my racing mind for a moment to try to get some perspective. What did I do today that prevented me from getting those other things done? Let's see. I started the day substituting for my son's teacher. I went from there to the grocery store to pick up some milk. While at the store I got a text from Mackenzie who had been taken home because she threw up at school. She asked me to pick up ginger ale, chicken noodle soup, and poster board. I brought that stuff home and put it away then rushed to pick up Felicity from her Catechism class. From there we stopped by my mom's to drop off some pictures. We came home, I fixed lunch for the two girls, and threw in a load of wash. Somewhere in all of that, I called the orthodontist and the eye doctor to move around appointments. Oh, I also folded two loads and put them away...and still made it to work on time. It was time for a talk. "Self," I said as gently, yet sternly as I could, "it's time to give yourself a break. Acknowledge what you did do instead of ruminating about what you didn't do. Take into account that you have five kids who all need you still. Take things one day, one moment at a time. Do what needs to be done and cut yourself some slack about the rest." I took a deep breath and nodded in agreement. Sometimes I'm right. "Okay then," myself continued, "chin up. Keep moving. You've got this. Right now the agenda is work. Do that and forget the rest." There was a virtual hug, pat on the back, and kick in the rear to get me out of the car. Turns out myself can be a good cheerleader and motivator. Putting that into practice is much harder than acknowledging it as the truth. Honestly, I'm hoping by writing this down, I will have it recorded. I will remember it. I will begin to live it. I can do ALL things through Christ who strengthens me. You can too! Let's do it together. I've been struggling with guilt lately. Mostly it has to do with working outside of the home and all that goes with that. I'm not able to attend all of the kids' events. Sometimes the house is a wreck. Some nights I get home to find out that no one really had dinner, unless you count Pop Tarts and cereal. The list could go on and on. Basically, I feel like when I'm not home everything and everyone falls apart and it's my fault. Maybe it's because I have my first...gulp...senior and life seems to be moving at the speed of a bullet train and I can't slow it down. Maybe it's my life long struggle with perfectionism. If it's worth doing or having, it should be perfect right? Well, not exactly thank goodness. Maybe it's the forever season I've been in where life is just not going the way it's supposed to (at least the way I think it should), or that I planned. Maybe it's getting back into the swing of school and all that that entails. Or maybe it's that I took one of two kids to a different doctor on six of the last eight school days. No matter the reason, the results are the same: me yelling at the kids about how they are messing things up, causing me more work, or not doing what they know they should, or me crying to Nelson about what a terrible mother I am and how I hate that the reason that everything and everyone seems to be falling apart is me. Sheesh. Sounds out of whack when I type it. I know enough to know the truth when I see it and, though there is a shred of truth in all of that, none of it is the whole truth. Today I was sitting in my room finishing up my prayer time, when Felicity walked in. "Hey, why don't you go get dressed and make your bed," I suggested, hoping that would buy me the time to finish up. She came back in with in a minute or two, and said, "Mama, let's go to the pool!" I thought this was an odd request because we haven't been to the pool since school started. Then I looked up and realized that when she went in to get dressed, the drawer she opened was the one with the bathing suits in it and she had one in her hand. She looked at me again, hair disheveled, eyes wide, dimples in full crater mode. "Mama...PLEASE. I really like the pool. I have fun there. We can go." As I began to explain to her all the things I had to do today, something stopped me. I looked at her miniature body and drank in her pleading smile. I realized, that although I had a lot to do, I didn't have a good excuse not to spend some time with this girl. So, we drove across town to our pool. 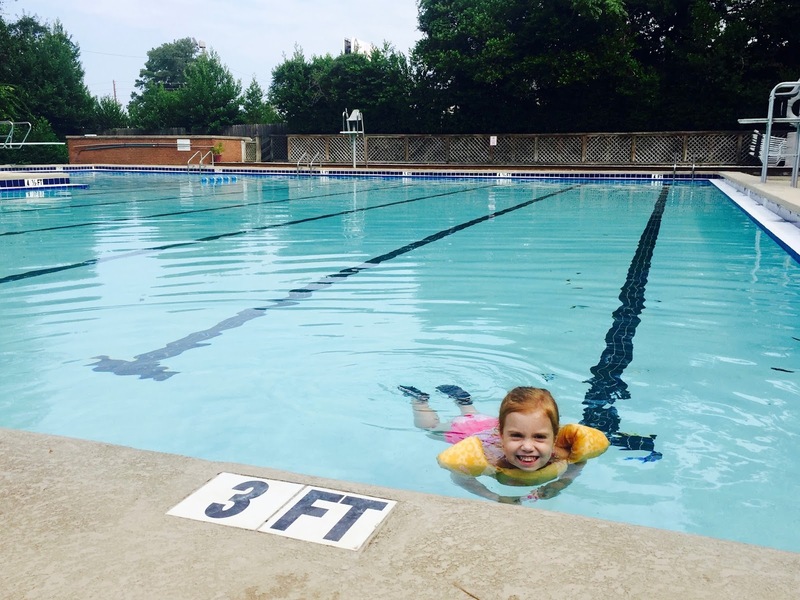 We signed a special waver this year that enables the pool to stay open for us even when no lifeguards are present. We arrived, punched in our gate code and had the entire place to ourselves. We swam, I videoed her "jumping in" in slow motion, we played some game she invented...just Felicity and me. As I drove her home, I began to remember moments like this I've had with all of the kids. Each, in their turn had some time with me once the bigger ones went to school. Some were lucky enough to get one on one time, others got it in smaller groups, but they all got it. For the most part, I've been to every event possible. I've taken them out to eat and cooked more meals for them than I can begin to count. They have had clean clothes when they needed them. I've made many trips to the school to bring a forgotten item. I've helped them study for countless hours and lost lots of sleep waiting for them to finish a paper they want me to check over. I've sent food for parties and celebrated the half birthdays at school (who knew there was such a thing?) of my summer birthday kids. In short, I HAVE been there. I still am. And, well let's face it, when you have five kids, you simply can't be everywhere for every one of them all the time. Sometimes you have to choose the 8 year old's soccer championship over the junior's volleyball tournament at the same time. Those are the moments when you thank God for friends who send you play by play updates of your girl who is having the game of her season, while you watch as your son's undefeated team loses their first game in the championship. You hate you missed the good game, but when you see the tears and give the needed after game hug, you know you're where you were needed most. I have to believe that God gets all of this. He gave me these kids and He knows their needs and loves them better than I do. Some days I see the big picture and am overwhelmed by the goodness of life. Other days I cry on my way to work and pray that Moses prayer, "God I can't, you can, and you PROMISED!" with tears streaming down my cheeks and fist shaking at Heaven. At some point I have to give in to Him and let Him be there in the times that I can't. When I was in school I used to have a little card I placed in front of me as I studied for tests. On it was written, "Do your best and let God do the rest". It gave me peace and reminded me that there's a lot more to the equation than me. Time to let go. Time to realize that God's got this...much, oh so much better than I do. Time to trust in that. This morning, as I was sitting next to Felicity during mass, I noticed her tediously peeling the paper off of her crayon. "Felicity," I whispered, trying not to cause a scene, "please don't peel that paper off." "Because it's making a mess." She continued the process, not phased at all by my request. She is three, which means she has her own opinion...about EVERYTHING and she's not afraid to let me know exactly what that is. "Felicity," I whispered a bit more sternly, "stop." She stopped for a moment, looked me straight in the eye and said very matter-of-factly, "I can do whatever I want." I was stunned by her brazenness - the absolute belief that her statement was true. I can do whatever I want. Let it settle on you for a moment. Let me assure you that her statement got dealt with immediately and as effectively as can be done in the middle of mass. I reminded her of a fact she had momentarily forgotten while she was caught up in her naturally self-centered world. Her theme song is "You Can't Always Get What You Want". We went on with the business of the day after mass, but still her statement haunted me. "I can do whatever I want." It sends chills down my spine. I grappled with it on and off during the day. She is my spunky kid and tons of fun. She is snugly and wild and expressive. She's also in the process of learning that the world, in fact, does not revolve around her. She's testing all boundaries and discovering how to be herself within the limits of being a descent human being. She's three. It's normal at her age to speak and act as if she can do whatever she wants. That's where I come in and teach her that in fact, you CANNOT do whatever you want. Right? I mean I don't think there are many, if any, parents who just let their toddlers do what they want all the time. Can you even imagine what that would look like? On second thought, maybe you can...watch the news. Suddenly I knew that what had been haunting me was not so much that Felicity had made this declaration of total autonomy, but that more and more adults in our world are doing the same thing. It's a simplistic way to look at things - but it's the truth. See something in a store you like but don't feel like paying for - steal it. Didn't study for that test like you should have - cheat. Make a mistake you don't want to admit - lie. Disagree with someone - yell, punch, or disown them. Don't like a church building or statue - tear it down. Someone makes you mad - shoot them. How come we can see the absurdness of this way of thinking in small children, but seemingly applaud the very same behavior in adults? At the core of most of these issues is an underlying mindset that says, "I can do whatever I want." When did that become okay? As Felicity's mama, it's my responsibility to teach her that she is not free to do whatever she wants. If she's angry, we teach her that it's not okay to slam doors and stomp off. When she's being teased by her big brothers, screaming at the top of her lungs is not the best way to make it stop. When she wants to eat marshmallows and lollipops for dinner (I kid you not, this was an actual request), I tell her no. When she wants to stay up with the big kids until the wee hours, I send her to bed anyway. The list goes on and on. It's a seemingly unending task. In her short life she's experienced a number of consequences that help remind her that she shouldn't do that particular thing again. In fact, she's beginning to see that life in general goes much better when she plays by the rules. In many cases, I need only to sing a few bars - "You can't always get..." before she begs me to stop and quickly complies. Maybe what the world needs right now is a parent. We need someone to remind us that we can't do whatever we want, whenever we want. We need to remember that the world does not revolve around us. We might need a timeout so we can think about our actions and ask forgiveness for our wrong doings. We need to practice the art of shaking hands, giving hugs, and saying, "I'm sorry". I suggest we begin with a morning wake up call over a worldwide speaker playing, "You can't always get what you want, but if you try (nicely) sometime, you just might find you get what you need." Yesterday was day two of school for Felicity. I ordered the big kids to load up for the pool. It worked so nicely Wednesday that I was ready to do it again – whether they wanted to or not. Since most of the world is back in school, we had the pool to ourselves for the first thirty minutes. The lifeguard let the boys get into the swim fins and off they went. Mackenzie grabbed a towel and headed for her favorite sunning spot. I started swimming. When I finished, I was worn out so I joined Mackenzie. The boys were having the time of their lives discovering the world of fins. By this time, two other families had joined us and were a nice distraction as well. I stretched out on the chair and just lay there quietly. It felt so indulgent…just sitting. After some much needed silence, I started a conversation with Mackenzie. We chatted about her upcoming birthday and her sweet sixteen next year. We discussed her new partner for Social and what she’d be doing as a Cotillion Club member. We watched a black and gold salamander crawl across the deck. I was immediately transported back to middle school when I was head-over-heals in love with Kirk Cameron. Growing Pains was my favorite show, he was just about the right age for me and I was convinced that he was as nice a guy as his character, Mike Seaver. Before I knew it, it was time to leave. “This has been so fun and relaxing,” I told Mackenzie. Our time together had only been about thirty minutes, but those thirty minutes felt like hours because we had slowed down and spent some quality time together. I loved, loved, loved the fact that I had just carried on a conversation with my daughter that she could have had with one of her friends. Later in the day, as I was dwelling on what a wonderful morning it had been, I thought back to the summer before Mackenzie started Kindergarten. I signed the boys up for a summer Mother’s Day Out program because I felt my time with Mackenzie slipping away. I had a strong need to spend some one-on-one time with her. It occurred to me that these few weeks that Felicity is in school before the big kids go back, is that same kind of opportunity. What an unexpected gift I’ve been given. Though I’ve been with the kids ALL summer, it’s been time that’s divided between watching Felicity, keeping up with the house and laundry, grocery shopping, running errands and the like. I know that years from now, the kids will remember me like that – frantically getting meals on the table and kids out the door, constantly folding laundry and cleaning house. However, I hope and pray what they hold in their hearts is not that side of me, but the side Mackenzie got at the pool - the mama who is very interested in everything they have to say, very proud of all of their accomplishments (even how fast they can swim underwater and backwards with fins on), and very much in love with who they are. Here’s to making more of those memories.